I don’t put much emphasis on playing private courses, but when I get a chance to play one I certainly won’t turn down the opportunity. After all, they are generally quite nice. 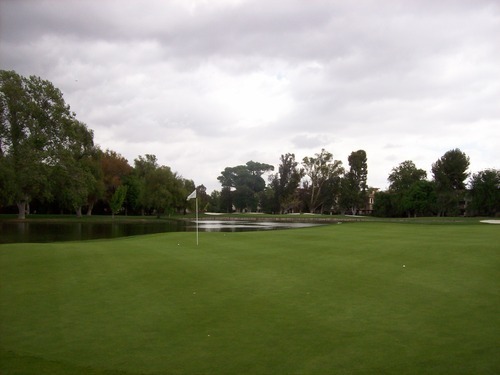 Such is the case with Valencia Country Club. At some point way back in the day, this was a public course, but it has been private for some time. So I was excited for the chance to play it. The LA Golf Group I belong to got a special group invite to come out and be “members for a day,” so a number of us went out to take advantage. 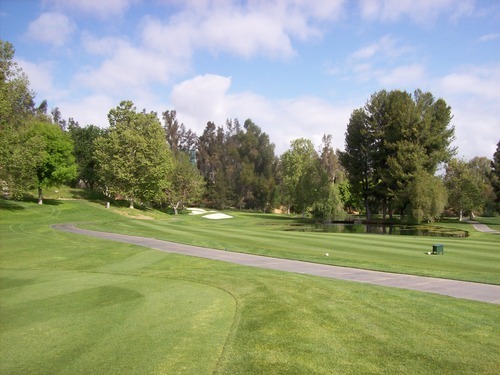 For just $65 to play this nice a course, it was a no-brainer. On top of that, we all got a sleeve of logo balls, a GolfSmith gift card and an Adams Golf poker chip ball marker. It was very nice treatment for us at a high-end facility. With the course being closed to members for maintenance, we basically had the place to ourselves. Our big group teed off as a shotgun at 9:00 and then there was a prospective member group that was going out at 10:00. My foursome was first off the 1st tee with nobody in front of us, so it was ideal. 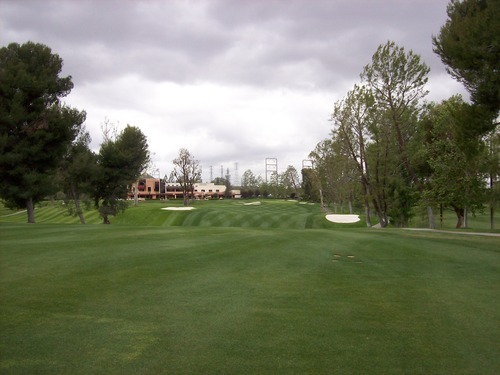 The weather was a bit gloomy, but it was a great day on a great course. 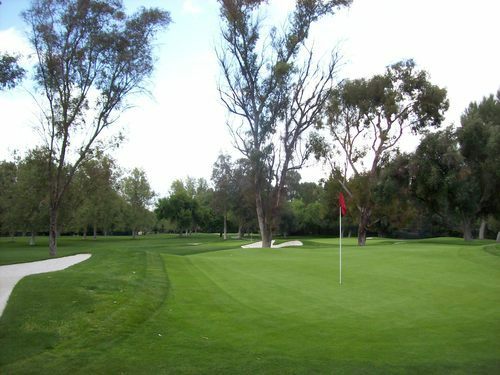 I’ll only speak briefly on conditions in order to state that the course was in exceptional shape. Just about every inch of the course was lush and green. 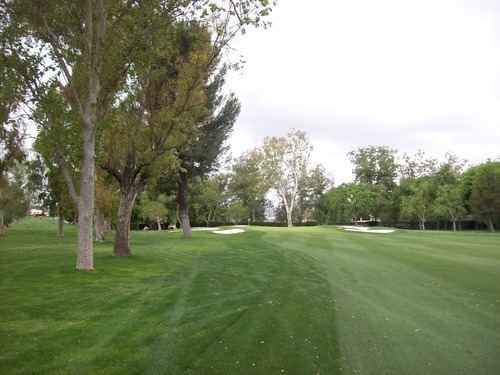 The cuts of the fairways and tiers of rough were nicely manicured. The rough was not deep, but very thick and tough to hit from. 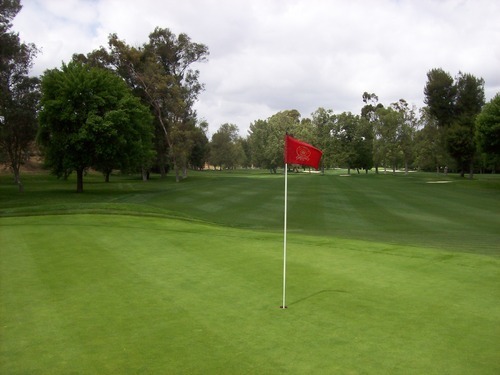 The greens were just about perfect. 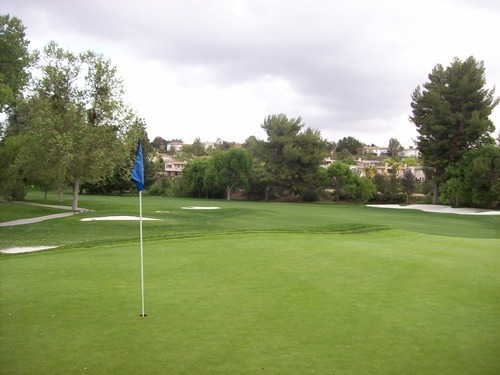 They were soft and receptive, but smooth and very quick on putts. Everything about this place was excellent. 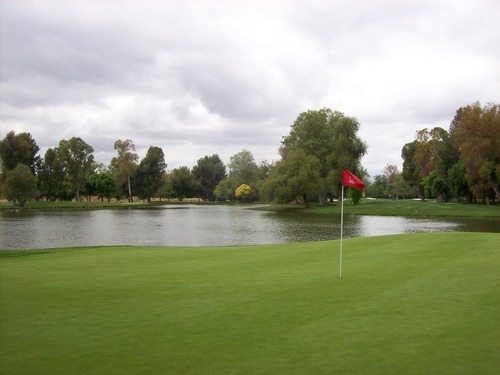 After watching play at Augusta all weekend, it was nice to play a beautiful green course right afterward. 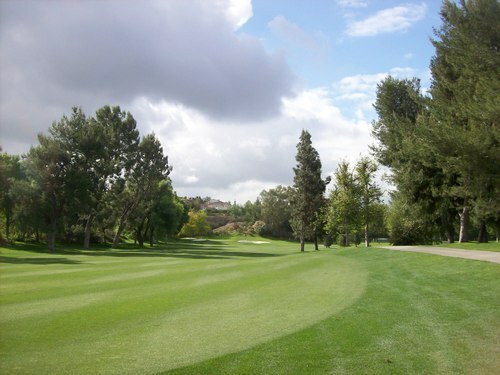 The course itself is a great layout. 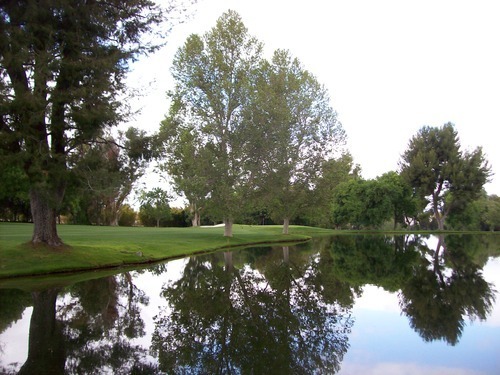 It was opened in 1965 and is a classic Robert Trent Jones, Sr. design. 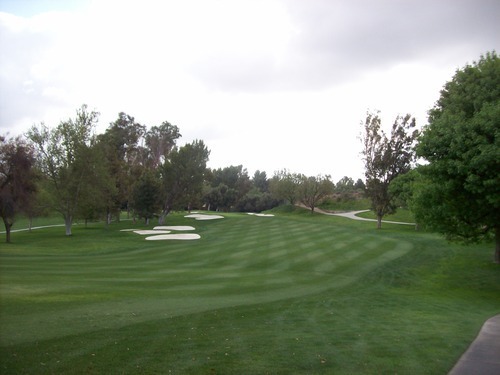 It’s a traditional layout that uses the natural contours of the landscape beautifully. 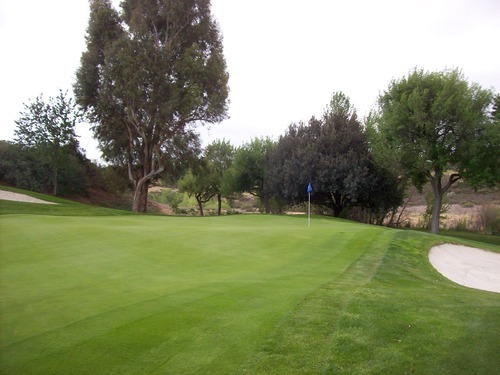 There aren’t any significant elevation changes, but there are some rolling hills and natural undulations on and around the greens to provide challenge and visual variety. Though all the holes fit together perfectly, no two feel or play the same. 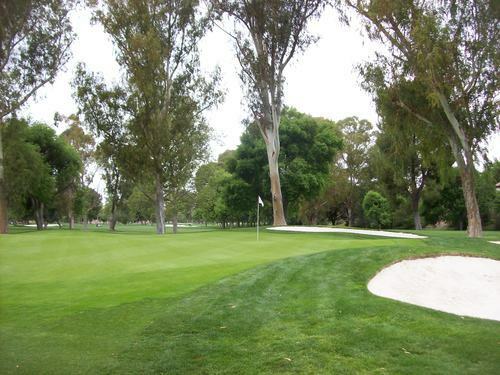 At one point, the course was public and many people still call it by its nickname “Big V.” (“Little V” would refer to the executive Vista Valencia just down the street). I might normally highlight a few of the most memorable holes, but there are too many great holes too talk about, so I will just say the whole course is fantastic. Parts of the front nine feel more like a Bay Area or Central Coast course and parts of the back nine almost felt like Georgia or South Carolina. 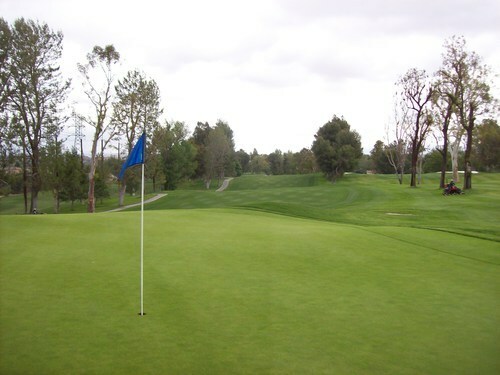 The only thing that really reminds you that you are in Southern California are the few front nine holes that border the busy I-5 Freeway. 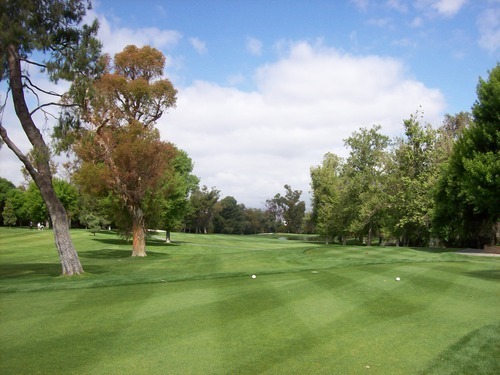 Valencia Country Club has a lot of dogleg holes, so positioning off the tee is crucial for a good score. There are many trees in play and they were wreaking havoc on my group all day. 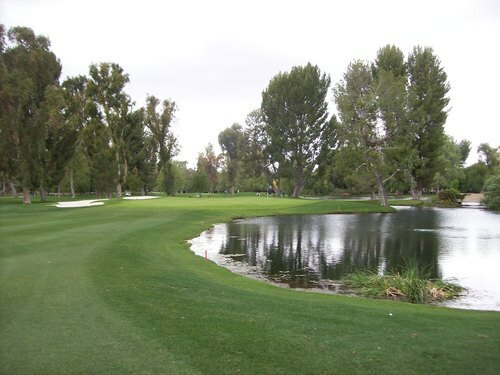 There is also a good deal of water on the course. 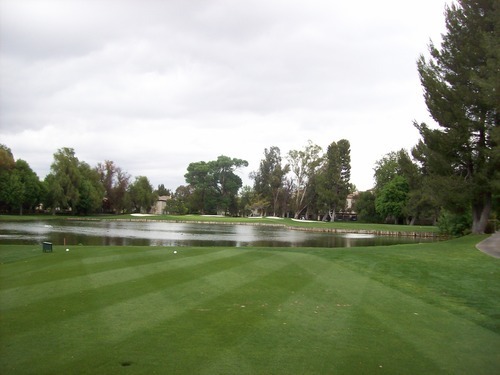 Having some more local knowledge would have helped on a few holes as I misjudged where the water was a couple of times. Almost all the greens here are slightly elevated. 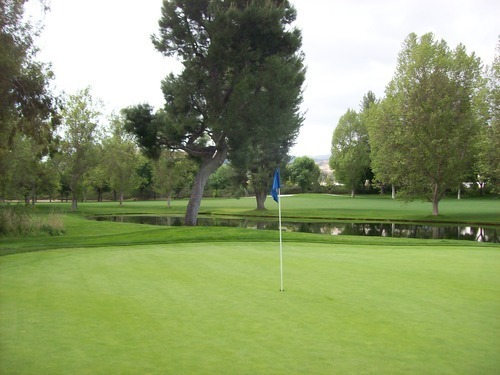 They feature a lot of undulation, making for some tricky putts. 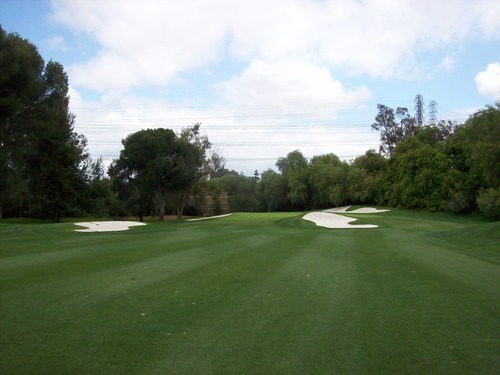 Many also have false fronts and bunkers all around to make it hard to play low run-up shots. The best approaches usually came in from higher angles. This is a course that will test you. It’s a tough track all the way around. 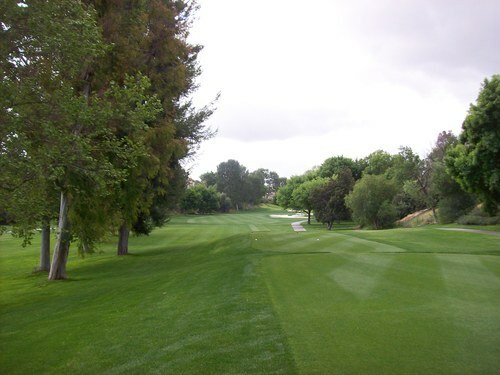 They’ve held pro events here before and they have a U.S. Open qualifying event here next month, so from that alone you know it’s a pretty challenging course. Nobody in my group could keep a consistent round going. We all had good stretches and bad stretches, but eventually we all lost balls, hit trees and found ourselves in the water. It definitely kicked our butts, but we were still loving every minute of our time on this fun and beautiful course. 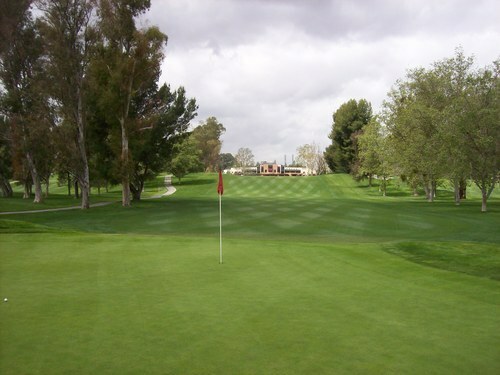 I don’t get too many opportunities to play private courses and my main local golf goals center around playing public-access courses throughout Southern California, but my experience at Valencia Country Club reminded why I should generally take advantage of any chances I get.